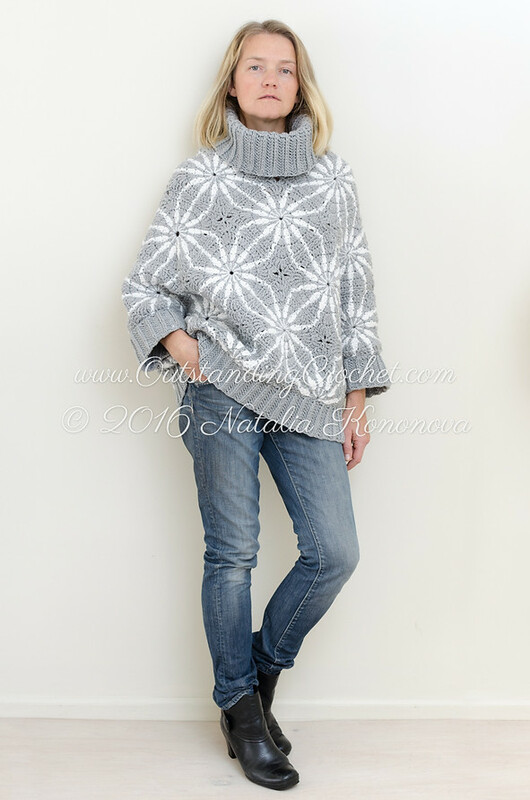 Outstanding Crochet: New Crochet Pattern is posted - Polar Star Poncho Sweater. New Crochet Pattern is posted - Polar Star Poncho Sweater. Polar Star Crochet Poncho Chunky Sweater Pattern (clickable link). As always, schematics, charts, written instructions with 106! step-by-step pictures. Skill level - Intermediate, but beginners, fear not - with so many step pictures you will be able to make it and level up. Worsted weigh yarn, crochet hook H - 8 / 5 mm. Don't forget - sign up for my newsletter and receive $2.50 discount. So somehow I accidentally deleted my comment! I was actually coming back to look at the pattern again - it's so lovely, you've outdone yourself, you really have. Sorry, this is not a website to place a free ad.